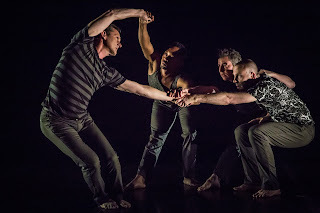 Dance Commentary by Heather Desaulniers: "The Missing Generation"
Incredibly moving. If I was asked to describe Sean Dorsey Dance’s The Missing Generation, those are the words I would choose. And yet that phrase doesn’t even begin to do this amazing piece justice. Choreographed and written by Artistic Director Sean Dorsey, The Missing Generation is a contemporary dance work that examines the early years of the AIDS epidemic. It talks about those who were lost in the prime of their lives. It talks about those who lived through and survived the horrors of that time, those who witnessed the senseless decimation of their community. It talks about those living with these memories still today. At its heart, The Missing Generation is an artistic dissertation on remembering. As a dance writer, I usually take a lot of notes during performances. But there are the few instances where I don’t do that, and it’s because I am completely engrossed in what is happening on the stage. Dorsey’s The Missing Generation was one of those rare experiences. Performed by the spellbinding quartet of Dorsey, Brian Fisher, ArVejon Jones and Nol Simonse, the sixty-five minute piece was scored by a combination of music and stories – real-life stories that Dorsey had compiled from individuals who experienced the early days of HIV/AIDS. There were stories of sorrow, stories of loss, stories of trauma. Sharp isolations, spasms and contractions shook through the bodies on stage; spinning motifs spoke to uncertainty, desperation and frustration. There were stories of love, stories of togetherness. Hands held the other tenderly, bodies locked in embrace, breath was in tandem. Unison sequences required each of the four dancers to tune into the other’s intention and need; three dancers lifted the fourth high in the air (a recurring motif); arms opened wide in second position. There were vulnerable personal stories, stories of both hiding and searching. During one of these particularly striking moments, Dorsey staged dance and choreography that went in and out of a single spotlight on the stage. Brilliant. And even in the midst of this sober subject matter, Dorsey managed to inject some lightness. Of note were the academic deconstruction of paradigms, stereotypes and terminology and the 1970s-style club duet (by Jones and Simonse). But the most powerful stories were those of community. The final unison scene felt like a group meditative practice. Gorgeous partnering abounded with supported arabesques and cantilevered physical sculpture. This choreographic theme was peppered throughout The Missing Generation, and its importance to the work is crucial. In order to attain these positions in space, the four dancers had to be all in, counter-balancing each other, supporting one another. Each individual in a collective working together to accomplish something bigger. Sean Dorsey Dance’s The Missing Generation is an iconic work of contemporary performance; one that I believe will be staged for years to come. It is that important. Not just as a noteworthy work of choreography (which it is) but because of its narrative message. When confronted with deep sorrow, it’s hard to know what to say and thus, we often choose not to say anything. Don’t. Ask, talk and learn.